Kishore Kumar » Blog Archive » Bappi Lahiri – Kishore Kumar:A special bond. Home » Kishore diary » Bappi Lahiri Kishore Kumar:A special bond. Bappi Lahiri is famous for the disco music in Bollywood. He introduced the disco music with an Indian flavor and brought many young singers into Hindi cinema. Bappi Lahiri was blessed to be born in a family dedicated to classical music. His father Aparesh Lahiri and mother Bansari Lahiri were famous singers in Bengali. Thus he got the first lessons of music from his home itself, a blessing that connected him with music at a much tender age. He started playing tabla at the age of three. Bappi’s association with Kishore Kumar can be considered as that derived not only from the adoration. He would fondly call Kishore as Kishoremama. Kishore and Bappi’s mother considered each other as brother and sister,even though she was not related to Kishore Kumar. Bappi, as a child, was a frequent visitor to Kishore’s house and Kishore would often say he is very cute and chubby. By the time Bappi entered into the realm of Hindi music, Kishore Kumar had become popular in Bollywood and had established his own brand in the Indian music, not only in Hindi but also in other popular Indian languages. Bappi got the first opportunity to compose music in Bengali as well as Hindi movie when he was 19 years old. His debut in the Bollywood was ‘Nanha Shikari’ (1973). Kishore subsequently sang for Bappi for the first time for this very film. The movie ‘Zakhmee'(1975) gave him a break in which he doubled his performance as a playback singer and a music composer. He sang the song ‘Nothing is Impossible’ along with Mohammed Rafi and Kishore Kumar for this movie. Bappi credits that his singing career began (in Zakhmee), when Kishore encouraged him to sing. Pic courtesy: Vishwas Nerurkar – The many faces of a Genius. Bappi and Kishore Kumar proved to be one of the friendliest combos in Bollywood music. Their association lasted till the death of Kishore Kumar in the year 1987. 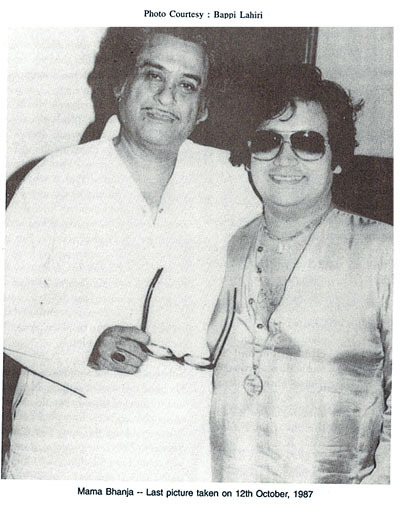 Bappi, like many other music directors, found Kishore Kumar a suitable singer for the unique tunes he composed. The popular hits of Bappi from the movie ‘Namak Halal’, ‘Chalte Chalte’, ‘Pag Ghunghroo’, ‘Aaj Rapat Jaayein’- were the contribution of the duo Bappi and KK. In 1984 another opportunity struck the duo in the form of the movie ‘Sharabi’ for which KK sang ‘Jahan Chaar Yaar’, ‘Manzilen Apni Jagah Hai’ and won a Filmfare award. Bappi’s music was made for Kishore Kumar and Asha Bhosle. KK’s adaptability to different music attracted Bappi towards him, like many other music directors. Many popular actors of the past and the present also insisted on Kishore Kumar for giving voice to their acting. Rajesh Khanna and Dev Anand in the past and Amitabh Bachchan in the present were among the many actors whom the voice of Kishore Kumar was as genuine as theirs. Bappi himself states, that Kishore sang his last song under composition for the movie, Waqt ki awaaz. The death of Kishore Kumar left Bappi with a deep hollow in his heart as well as his music career. He was so dependent on KK that it took some time for him to find a substitute for the lost legend. He thus introduced Alisha Chinoy and Vijay Benedict as the new pair for his duets. The Bollywood had always been favorable to Bappi- Kishore Kumar duo. The only fact, their devotion towards the music, was sufficient to unite the souls of these two-generation maestros of music into one. The perfect creations produced by their harmonious association thus challenge all the questions concerning the co-existence of different generation artists. This entry was posted on Wednesday, June 20th, 2007 at 1:07 pm	and is filed under Kishore diary. You can follow any responses to this entry through the RSS 2.0 feed. You can skip to the end and leave a response. Pinging is currently not allowed. KK Bhappi Lahiri bond is indeed something special. In the 80s with falling standards of in fill making one doesn’t see much contribution from the KK-Bhappi combo except for ‘Namak Halal’ and ‘Sharaabi’. Plus Bhappi’s rise in 80s was due to gradually downfall of Pancham in the mid 80s. So many Pancham songs went to Bhappi. There is one more film ‘Mohabaat’ which has exceptionally good music. Bhappi himself has sung many songs which were hits. “Pyaar Maanga hai Tumhee se” is beautiful, it’s silently romantic. And “Kabhi Alvidaa naa kehnaa” is another great. Bappi Lahiri’s success was really mainly due to he got the world’s greatetest singer,Kishore Kumar,for many of his songs. Really the way the genius Kishoreda paved the way for Bappi Lahiri’s success is great.Kishoreda is immortal,the world’s most popular genius.I even dream about Kishoreda. Sapna Dekhna buri aadat nahin hai… magar sapna to sapna hi hota hai na? The combo is awesome,no doubt.Hats off to Kishoreda,the boss of all bosses. I ALSO AGREE WITH KK KALAN–HATTS OF KISKORKUMAR–”THE BOSS OF ALLBOSSES..— C.D. PATEL. Also in bengali songs,this duo creared record and history.JAI KISHORE KUMAR!!! I really appreciate this artical, and thankful to all the person who worked to make those information available to us. Kishoreda–a great Singer & Bappida–a great Music Director. The Combination of these two great artists created many memorable song like Pyar Manga hai, Aao mere paas or aao, etc etc. Approximately all the songs were hit on Box office. can u give me mail add to bappi lahiri plz plz plz………. maine aapne jindgi kisi ki jindgi padhi hai to woh hai kishordaji. I LOVE KISHORE KUMAR. MAIN KISHOREDA KA BAHUT BADA FAN HU, MAIN USKA FAN HI NAHI A/C BHI HU. KASH WHO AAJ JINDA HOTE, JHA BHI HOTE MAIN UNSE MILNE JATA. Abhi Shayad, marneke bad hi mil payuga. through his voice.no body can become kishore kumar,. amar shilpi tumi kishore kumar tomake janae tronam. I am looking for the song rahen na rahen chahe hum aur tum from Ek LARKI BADNAAM SI, can anybody send it to me please? kishor kumar’s songs totaly change my mood. has a recording!!! However it has saddened me to see his voice rendered fast post recording. Bappida has given really some intoxicating melodies with Kishoreda. Only Kishoreda can do justice with them. I want to mention some of my close favourites of this pair. “Kitne raanjhe tujhe dekhke bairagi ban gaye” and “Sapno ke shaher, hum banayenge ghar” from AHSAAS, ” Vaada hai kya kya hai kasam” from TAXI CHOR, “Saath mera chhod kar, chal diya tu kahan” from PYAAS, “Yeh naina yeh kaajal” from DIL SE MILE DIL. KISHORE KUMAR SAHEB AND MOHD RAFI SAHEB ARE THE WONDER OF THE WORLD. KISHORE DA IS A GOD GIFTED VOICE LIKE GREATEST RAFI SAHEB.